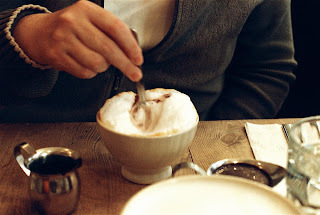 ChemE claims that the best cafe mochas on earth are served at Le Pain Quotidien. We like to get her at least one when she's in the city. I had to work fast to get this shot, she'd already poured in the chocolate and was stirring down the foam. If I'd waited another few seconds for the perfect focus she'd have been finished entirely. What do you like to drink when you wake up? While that certainly LOOKS delicious, I know that it's coffee and I just don't like coffee. I know, I know - people think I'm whacko, but I just never developed a taste for the stuff. More for the rest of you. My morning drink (and I know this will make you cringe, Kizz - that's not my intent) is a glass of Ovaltine. Two spoons of the stuff (which is FAR less than the package recommends) in a glass of cold 1%. Often, it's my only breakfast. Looks reallllllllllly good! My morning drink is a nice cold can of Diet Coke. I know, I know. But I do like a nice latte or mocha from Starbucks on occasion. I'm not here to disparage anybody's beverage choices. I don't drink coffee, or eat anything coffee-flavored, never have. I spent much of my life, so blissfully much, having coke for breakfast, lunch and dinner. Now that I don't drink caffeine and I'm trying to lose weight my blah morning beverages are water and a tiny serving of chocolate milk. If it's a terribly special occasion or a day when I know I'll be doing a lot of physical activity I'll have a skim hot chocolate, I do still love me some hot chocolate. Sometimes I remember that I like tea, but it is rare. Here's my drink (note: up until a couple of years or so ago, I never, ever, drank coffee, and I still do not like coffee-flavored candies or other treats). Make coffee (commercial crap) in drip coffeemaker (like Mr. Coffee). Pour an inch or so of 2% milk in large mug, microwave for one minute. Pour coffee into heated milk, add sugar-free flavor from Torani (caramel or vanilla usually). Drink. Folger's French Vanilla. Nectar of the Gods. Oh and it doesn't cost four bucks a pop either, which is nice. I've never been a coffee girl either. Every once in a blue moon but it upsets my delicate disposition. I drink hot green tea, dash milk, 2 Splenda's! And occassionally a Vitamin Water, Dragonfruit. I'd really like to have rum. Oh lordy that looks good.